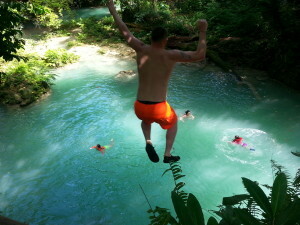 The Blue Hole Is an unforgettable, amazing nature paradise hidden in the mountains of Ocho Rios! The estimated drive time is one hour and 45 minutes with various stops at points of interest on the way. 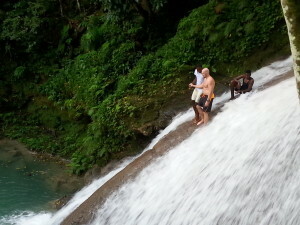 Mike and Gena, contacted us from Hilton Rose Hall Montego Bay Hotel, for a visit to the Blue Hole and Dunn’s River Falls. Gena and Mike requested a 9:00am pickup for their tour. Upon arrival we were greeted by this wonderful tour guide name Little-T, we all walked down a hill through a narrow gate on to the Blue Hole Property with it’s amazing scenery, he then took us up the river were we discover some small water falls surrounded by many of Nature Swimming pools! Many visitors are surprised how wonderful the place is! To top the day off Little-T took Mike all the way up the top of the water falls to jump off , into the Blue Hole! What an amazing Day Tour ! I wonder how much is a taxi in this beautiful place?